This is probably the most important question to answer if you are new to DFS hockey. The impetus for this entire series comes from Jonathan Bales’ books. This week, it’s time to shift our focus to the goalie position. How can we find value? How can we improve our odds of consistency at such a variance-filled position? How does ownership come into play? At goaltender, wins are weighted significantly in both DraftKings & FanDuel scoring. This could be why ownership tends to closely mirror Vegas moneylines. From a macro perspective, Vegas favorites only slightly underperform their salary-based expectations in comparison to underdogs. Historically, favorites are also far more consistent, but they (unsurprisingly) carry much higher ownership as well. How can we find an edge? 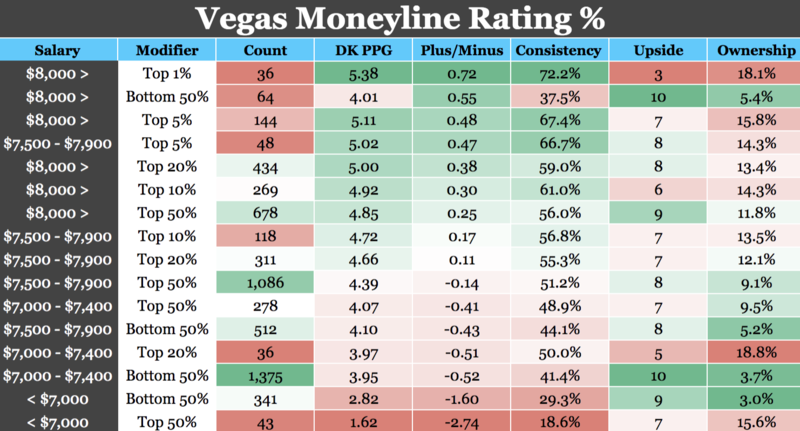 The following charts highlight goalies using different percentile buckets for our Vegas Moneyline Rating metric. This gives us a way to quantify how large or small a favorite is relative to our historical database. Anything over the 50th percentile is favorites and below are underdogs, with the 99th percentile obviously being the largest favorites, etc. Vegas makes money, so it makes sense that goalies playing in games in which they are more heavily favored perform much better. In general, goaltenders have performed well below their salary-based expectation until the top-20 percentile bucket in Vegas Moneyline Rating, but the Plus/Minus and Consistency skyrockets in the top-five percent. The problem with attacking heavy favorites — from a game theory perspective — is ownership tends to be at its peak as well. That said, I would also argue underdogs are over-owned relative to their expectation. This still doesn’t exactly tell us if we should be paying up or down at the position to achieve the best chance of exceeding value. Let’s examine how moneylines impact goaltenders at different price points. Does paying up for a goaltender — even one who’s heavily favored — give you a false sense of security? It’s important to remember that with an elite goalie you may have a tougher time jamming in a top-tier shooter or even an offensive defenseman. In comparison to our baseline trend where simply targeting a favorite underwhelms, paying up for goaltenders as heavy favorites on DraftKings appears to be the clear path of least resistance. Certainly, the counts are small for the top-five percentile bucket, but that doesn’t necessarily mean they are completely unrepresentative. Perhaps a player like Andrei Vasilevskiy, priced at $8,300 and $8,400 against the Canadians and Wild (a 99th percentile Vegas Moneyline Rating) in the last week of December, shouldn’t have felt so out of reach as the highest-priced goalie on the slate. He scored a tremendous 8.2 and 9.4 DraftKings points at 9.51 and 23.55 percent ownership, respectively. Every slate is different, but the point is, even at roughly 24-percent Vasilevskiy was still likely under-owned relative to the prime spot he was in. The public’s tendency to pay down for suboptimal situations could be a massive inefficiency to exploit. The outlier appears to be goalies priced at $8,000 or higher as underdogs. 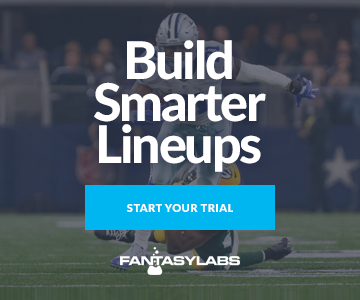 Their 0.55 DraftKings Plus/Minus is appealing, but a low 37.5 percent Consistency rating is tough to recommend for cash games. Perhaps this is the situation where we can use the randomness of goaltender to our advantage. Identifying factors that drive ownership in large tournaments is important. Although this bucket may be risky for cash games, they carry a ton of Upside at low ownership. Philipp Grubauer comes to mind against the Hurricanes two weeks ago. At $8,100 with a 35th-percentile Vegas Moneyline Rating, the Capitals goalie was the second-highest scoring player at the position and carried a low seven-percent ownership in large field guaranteed prize pools. On the subject of pure upside, the negative Plus/Minus underdog goalies could also provide a ton of leverage due to their low ownership and high Upside. This could be due to an underdog’s likelihood to see more shots. Favorites look to be the preferred option for value across each pricing tier, but intuitively, you can gain a huge edge on the field by rostering a low-owned goalie against a chalk offense, especially if they steal an unlikely win.